Wildfires raged throughout California once again this year as state lawmakers worked to address the searing issues of California’s new No. 1 problem: How to cope with infernos killing scores of people and costing billions of dollars in damage. Devastating fires are “the new normal,” Gov. Jerry Brown warned this summer. Temperatures continue to rise, and the mix of drought-stricken, fuel-laden forests and nearby homes for millions of Californians is proving ever more combustible and deadly. Over the past two years, firestorms have claimed the lives of 57 people in California, destroyed more than 9,000 homes and scorched more than 4,000 square miles from San Diego to the Oregon border. A state firefighter called the situation a “perfect storm” and a Santa Rosa Christian pastor said it reminded him of the “end times” prophesied in the Bible. The catastrophes triggered a search for solutions within firefighting agencies, power companies, the insurance industry and the halls of local and state government. It culminated on Sept. 21, when Brown signed 29 measures into law addressing a host of issues from forest management, mutual aid and emergency alerts to price gouging on rental homes and safety mandates for new electric garage doors. “There were really things that needed to happen for the benefit of all Californians,” said Michael Wara, a lawyer and Stanford University scholar focused on climate and energy policy. “I had pretty modest expectations going into this,” Wara said, noting the issues facing lawmakers were complex and the time was short, with an Aug. 31 deadline to pass legislation and the November election looming to determine Brown’s successor. But the professor was impressed with the Legislature’s performance. “I’d give them an A-minus,” he said. In early July, Brown called on a bipartisan committee of lawmakers to develop proposals to strengthen disaster preparedness and respond to increasing wildfire danger. The top issue would be balancing liability for last year’s wildfire damages between electric utilities and their ratepayers, recalled state Sen. Bill Dodd, a Napa Democrat. Three weeks later, there were 15 fires burning. “It became clear to us we really had a big job to do,” said Dodd, co-chairman of the 10-member committee. Wara, who was called as a witness at the committee’s first hearing, said it was “almost a no-brainer” that California had to spend more money on “vegetation management,” the term that refers to controlled burns, thinning forests and other means of reducing the fuel available to fires. He recalled that Cal Fire Director Ken Pimlott was asked at a hearing how much it would cost to make the wildlands safe. Pimlott couldn’t say. “It’s such a big problem they never even thought they would conceivably have the resources to address it,” Wara said. Assemblyman Jim Wood, a Santa Rosa Democrat who served on the committee, risked some political capital by stating he would not vote for the committee’s centerpiece bill without guaranteed annual funding for vegetation management, which he said should be $300 million a year. That bill, SB 901, ultimately included just one new appropriation — $200 million a year for five years, or $1 billion — for vegetation management. Wood, who also wrote five other fire-related bills, said he and Brian Dahle, the Assembly Republican leader from Lassen County, had been pushing a fire prevention plan for four years and the hazardous summer provided the right time to sell it. “Jim Wood really lit a fire under the committee and the administration to get this done,” Dodd said. “That was an accomplishment,” Wara said. Cal Fire had dispensed $243 million in grants to local fire agencies and nonprofit organizations for controlled burns, forest thinning and other fire prevention programs over the past five years, according to Porter, the agency’s region chief. Wood’s other bills include AB 2551, which authorizes Cal Fire to collaborate with private landowners on prescribed burns, and AB 1919, which makes it a misdemeanor for a landlord to boost rent more than 10 percent in the wake of a disastrous wildfire. One of Dodd’s bills, SB 969, requires all new electric garage doors to have backup batteries allowing them to open during a power outage. At least five people who died in the North Bay fires did not or could not escape through their garages. The committee’s toughest chore was establishing liability for the damage wrought by the October 2017 wildfires, estimated at $10 billion to $15 billion. Cal Fire has determined PG&E equipment caused 16 major fires across Northern California in October, and in 11 of the blazes the utility had failed to keep tree limbs clear from its equipment. PG&E, which serves 5.4 million power customer accounts from Eureka to Bakersfield, has said it had about $840 million in insurance and expected to pay at least $2.5 billion in fire damages and possibly much more. “There was a balance to be struck,” Wara said, between the interests of PG&E and its ratepayers. The San Francisco-based utility, which spent nearly $1.7 million lobbying state officials, pushed for approval of a plan that would allow it to sell state-authorized bonds to finance billions of dollars in damages, with customers paying for them through charges on their power bills. Dodd dismissed the proposal as a “total bailout” for the utility. PG&E also failed to convince lawmakers to soften California’s stringent standard that holds power companies responsible for wildfire damage caused by their equipment, even when a utility has done nothing wrong. Wara warned the committee that forcing PG&E into financial jeopardy would result in higher costs for the utility and its ratepayers. SB 901 ultimately included a provision that allows PG&E to tap ratepayers for some wildfire costs, provided it opens its books for an examination by regulators, referred to as a stress test. The California Public Utilities Commission is authorized to determine the limit PG&E can pay without harming ratepayers or impacting its service. Any additional amount can be financed by sales of state-sponsored bonds which will be repaid by customers through charges on their bills. PG&E said the average residential customer would pay about $5 a year for every billion dollars in financing over the life of the bonds. In response, he said PG&E has implemented round-the-clock staffing of a new Wildfire Safety Operations Center during fire season, cleared vegetation around 130 miles of power lines in areas that face extreme wildfire threat and installed more than 100 weather stations and nine early fire detection cameras in high-threat areas, with more of each to come. SB 901 requires utilities to prepare each year a wildfire mitigation plan, including all known fire risks in its service area and how it will account for the risks. The plans must be approved by the Public Utilities Commission. The Utility Reform Network, a San Francisco-based watchdog group, said the results of SB 901 could be catastrophic for ratepayers. “Consumers should not be on the hook for negligent actions by PG&E or any other utility, and shareholders should not be given a free pass at the expense of hard-working Californians,” said Mindy Spatt, a TURN spokeswoman. In response, Dodd said the organization’s statements bordered on malpractice. The California State Association of Counties said SB 901 was “a big success” in balancing the interests of PG&E and its customers. “We don’t think a bankrupt utility is beneficial to the state,” said Cara Martinson, the group’s legislative representatives. Improving emergency warning systems was a key focus of state Sen. Mike McGuire, a Healdsburg Democrat. He developed legislation in response to the chaos that erupted in Sonoma County the night of Oct. 8, when thousands of residents received no warning of the wind-whipped flames that were about to engulf their homes. The law he authored, SB 833, requires the state Office of Emergency Services to develop a statewide protocol for emergency alerts to be offered to all 58 counties. “In the age of mega-fires we need to have a universal alert systems,” McGuire said. “It’s beyond time we adopt 21st century technology to protect our residents in every corner of the state. Sonoma County officials were severely criticized for failing to issue widespread alerts and have since reorganized their emergency response operation. 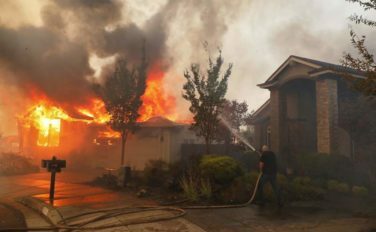 Emergency warnings proved “wholly inadequate” in Sonoma, Napa and Mendocino counties during the October fires, Dodd said. The state budget includes a $50 million boost to the mutual aid system for California fire departments, with half of it available to pay for pre-positioning of firefighting resources under hazardous weather conditions, McGuire said. Fire departments statewide made 35,600 mutual aid requests last year, and about 11,000 went unfilled, he said. The senator said he’s hoping Brown will sign a bill that provides $5 million for a California State University study that would include an analysis of firefighters’ mental health needs. Firefighters have seen communities destroyed and their colleagues killed, McGuire said, while also enduring the “incredible strain” of working for months at a time separated from friends and family.